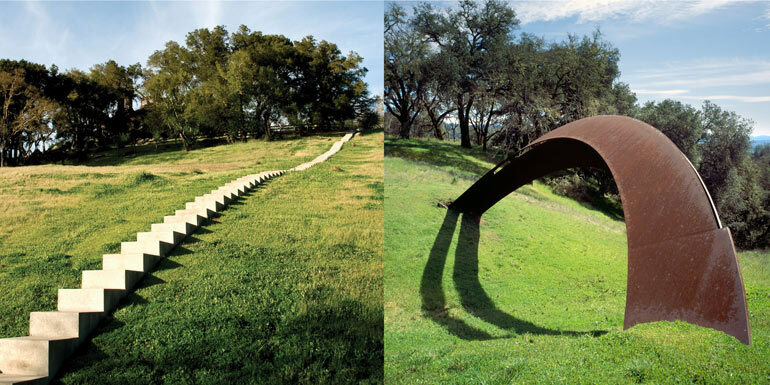 Join us for a very special spring stroll around the grounds of the privately-owned Oliver Ranch in Sonoma County, which features an extraordinary array of commissioned, site-specific art installations that are in dynamic dialogue with the surrounding environment. Join us for a very special spring stroll around the grounds of the privately-owned Oliver Ranch in Sonoma County, which features an extraordinary array of commissioned, site-specific art installations that are in dynamic dialogue with the surrounding environment. Tour participants will view installations throughout the property including works by internationally-renowned artists Andy Goldsworthy, Ann Hamilton, Viola Frey, Martin Puryear, and Richard Serra. Docents will provide an informative tour of the grounds and the remarkable stories of what it took to realize these monumental projects. Following the 2+ hour sculpture walk, enjoy a rustic Italian lunch at Diavola in Geyserville. Attendees will drive themselves to Geyserville and take a shuttle to the private residence at Oliver Ranch. Don't miss this extraordinary opportunity! Space is limited. Includes a bus ride from designated location in Geyserville, lunch and beverages. All proceeds benefit Berkeley Art Center, a private, non-profit organization.